Social Justice Perspective: Thinking about the effects of social determinants, trauma, discrimination, and oppression on our mental health. 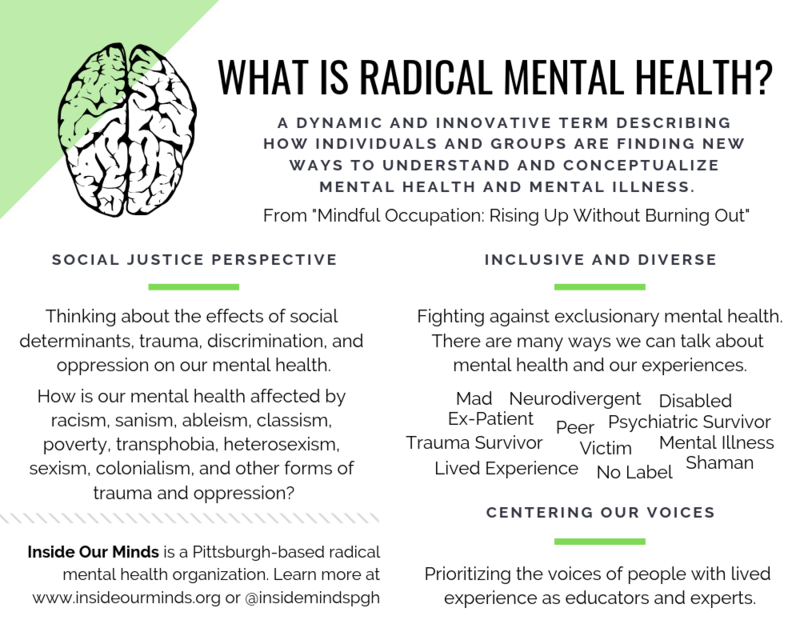 How is our mental health affected by racism, sanism, ableism, classism, poverty, transphobia, heterosexism, sexism, colonialism, and other forms of trauma and oppression? Inclusive and Diverse: Fighting against exclusionary mental health. There are many ways we can talk about mental health. Mad. Neurodivergent. Disabled. Ex-Patient. Peer. Psychiatric Survivor. Trauma Survivor. Victim. Mental Illness. Lived Experience. No Label. Shaman. Centering Our Voices: Prioritizing the voices of people with lived experience as educators and experts.